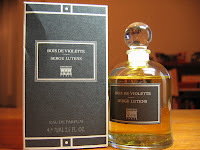 I first smelled Bois de Violette in 2005 on a perfume tour in Paris. My guide took me to Serge Lutens, a house I'd never heard of, on the first stop on the tour. I remember thinking, huh, nice perfume tour, why aren't we going to Jean Patou? Or Chanel? If only I knew then what I know now ... Bois de Violette would have been mine much sooner. The sales associate at Serge Lutens sized me up and down and suggested I sample Un Lys. She put a drop on my arm and then had me compare it against each other fragrance I tested. Un Lys: so pretty and fresh! Next up was something or other-- Douce Amere, maybe; I liked Un Lys better. Then, Bois de Fruits; which did I like better? Un Lys. Next: Bois de Violette-- which did I prefer? I smelled both arms again and again and couldn't decide. Un Lys was gorgeous on me: all white lillies and dainty flower petals. Bois de Violette, however, was just as pretty, but in a darker, woodsier way. I smelled tones of vanilla and sweet wood, hints of violets and forest floor. Ultimately, I prefered Un Lys, but it didn't matter because in the end, I didn't buy either one. I told my guide, I don't want to blow my wad now when there's two more houses to visit (Guerlain and Montale). I left Serge Lutens with a small wax sample booklet and beautifully scented arms. What a bust! Guerlain didn't do anything for me (although my aunt fell hopelessly in love with Mitsouko parfum) and neither did Montale (I did meet Monsieur Montale, who gave me a decant of Crystal Flowers in exchange for a kiss -- story to follow in a future post). I didn't buy anything at either house. I went back to Serge Lutens the next day while on a walk with my dad but they were closed. I did manage to get a small sample of A La Nuit from Sephora, but aside from that, I left France with no Serge Lutens. Flash forward a year later to me unearthing that wax sample booklet. I retried Un Lys and found it way too heady and airy. Bois de Violette, however, was just like I remembered it: all cedar and violets swirling around in competition with each other. I couldn't wait to get to Serge Lutens on my next visit to Paris. I bought it on the last day of my visit. I saved it for last because it was the biggest, most fragile bottle, and I didn't want it to break in my backpack while traveling. It's a bell jar and has no spritzer. It was wildly expensive, but worth it. Paris is the only place it's available. It felt so luxurious walking through the arcades and gardens afterwards with a tiny Serge Lutens bag on that sunny fall day. When I got it home, I decanted it to a small spritzer and gave myself a spray. I couldn't wait to bask in the glory of violets. I'd waited so long-- two years! It wasn't how I remembered it. It was so ... unusual. The cedar just took over. I couldn't detect any violets. It turned strangely smoky on my skin after 10 minutes. It had a sweetness I couldn't place - not a candied violet sweetness, but a more vanilla smoky tea sweetness. I didn't wear it for weeks, months. The little spritzer on my dresser taunted me. Occasionally I'd give it a spray but it made me feel claustrophobic. It was simply too much. Eventually, I decided not to spray it, but rather spray a cotton ball and dab it lightly on my wrist. I had to give it another go, especially in this cold weather. It's much more an autumn/winter scent to me. It works much better on my skin now that I'm dabbing it. A little goes a long way on me. I think when I sprayed, too much came out and it was overpowering. I've been wearing Bois de Violette all week and it keeps intriguing me each time I wear it. To my nose, the first few notes are soda-like; cream soda, ginger ale, vanilla. It smells like a smooth cedar plank. It's so warm. The violet comes out on my skin after about 25 minutes. I get impatient sometimes waiting for it, but the warm woodsy cedar keeps me smelling. I still don't know if I'm in love with it or not; but for that reason, I think I must be. It's limitless on my skin. It keeps me on my toes. It's soothing and comforting. It's something I reach for when I want to feel warm. It's like a cashmere sweater. It's quite possibly the most intersting perfume I've ever smelled. I am very partial to the scent of geraniums and am not acquainted with any conventional perfumes which may contain it. Is it only found in essential oil blends? I would love to hear your views or experience with any scents including geranium, if possible. Thanks for commenting. It's always good to know someone in the world (aside from my family) actually reads this blog, especially with my infrequent posting as of late. ps: which NR do you prefer, the EDP or the EDT? so it's only available in paris? yes, it's only available in paris. although, i think the perfumed court might have decants you can buy? it's beautiful; very cedar on me. definitely worth checking out! It is now available at Bergdorf Goodman in NYC, although not through their website, only by calling the store and ordering (or visiting the store). I come to discover your blog and had to write a comment although this post has been written quite a long ago because of your particular way of describing such a personal experience; I really like how you express yourself!. I´m a real fan of Lutens work. Heé simply a Magician. I detest commercial perfumes and the ones he creates are so far from standard rules... they are often difficult to understand at the first try that´s why I usually compare them to relationships: sometimes you like someone at the first sight but finally is a fake, sometimes you don´t and finally you find he/she has been a real discover in your life. I always use à la nuit, feminité de bois and louve... All of them are close to my "life-smells" and actually I discover the new one L´eau, simple ? noooooo!. I would like to try - someday, somehow - the one you talk about in this post as I´m very fond of violettes ( although I know this is not just violettes ), and also Fille en Aigilles because I´ve been told it´s "dirty/dark" violletes. Did you smell it? From know on I´ll read your blog often as I also like teas very much! A place to read reviews on scented treats: perfume, tea, lotions and anything else that strikes my fancy.